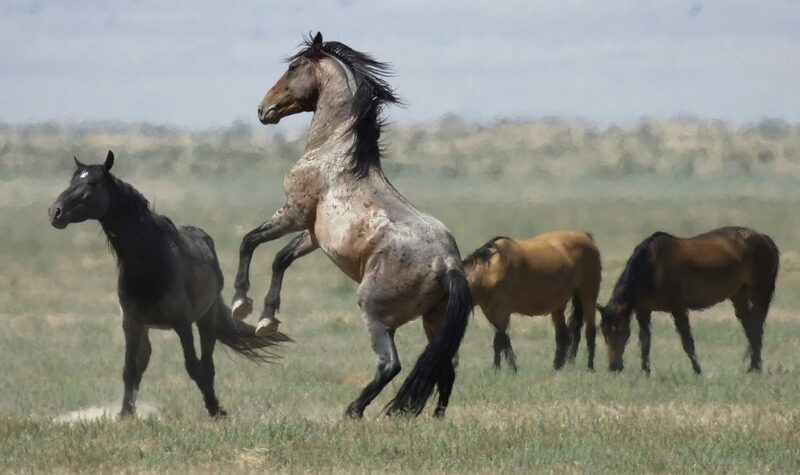 The Associated Press In this July 18, 2018, file photo, a wild horse jumps among others near Salt Lake City. The U.S. government is seeking new pastures for thousands of wild horses that have overpopulated Western ranges. Landowners interested in hosting large numbers of rounded-up wild horses on their property can now apply with the U.S. Bureau of Land Management. “It’s not like you can do this in your backyard, or even a 5 acre plot,” said Debbie Collins, outreach specialist for the U.S. Bureau of Land Management’s Wild Horse and Burro Program in Norman, Oklahoma.